I don’t write much about food, but I hope you’ll allow me this digression today. A friend and I recently sat talking at her kitchen table about blogging and writing, and she asked me if I ever have a topic that just will not leave me alone until I write about it. I answered “Yes” without hesitation. My dilemma about my dinner plate is a perfect example. Because I have an egg allergy, I’ve often joked with my husband that if I ever became a vegetarian, I might as well become a vegan, because I’d already be almost there. The obstacle to me becoming a vegetarian or a vegan? I love meat and cheese, butter, ham broth and lots of other animal products. When I was growing up, I would look at my mom cross-eyed if she cooked a dinner that didn’t have some sort of meat in it. I would happily eat just about any meat she put in front of us (however, I ate asparagus – my least favorite vegetable – every day for a week one time just so I’d never have to eat liver again. I’m still waiting for a “thank you” from my dad and brother for that sacrifice because she never made it for them again, either.). Our family traditions and gatherings often center on food, but most especially meet: turkey at Thanksgiving and Christmas, marinated lamb at Easter, barbecue for special birthday or anniversary celebrations. My sister-in-law makes a fabulous pork roast, and I can always count on my brother to whip up something tasty on the grill. I sometimes think I could eat chicken every day for the rest of my life and be perfectly happy. Or I used to think that. A couple of weeks ago, I watched a documentary called Vegucated (a film I heard about thanks to a blog about running, exercise and food I’ve been following). The film-maker challenged three meat-eating New Yorkers to try a vegan lifestyle for six weeks, and during that time she educated them about where our meat comes from. I haven’t had chicken since. There are haunting images of animals being castrated and killed in brutal ways. Of baby chicks being dumped off of conveyor belts into a box because they’re boy chicks (and therefore deemed useless). Of horrific cramped farm conditions. Of newborn calves dragged immediately away from their mothers and milk cows forced to give birth repeatedly to keep them producing milk. Of loads of dead fish getting dumped back into the ocean because they’re not the right kinds but had the bad luck to get caught up in the fishing nets. It’s a damning indictment of how we treat animals to feed ourselves. I’m a city girl, always have been and probably always will be. That means I’ll always rely on grocery stores for most of my food. But that reliance does not acquit me of my responsibility to know how my food is produced. When I was in college, I gave up eating veal while taking a philosophy class from a staunch vegan. I never knew before about the conditions veal calves were raised in until then, and it opened my eyes to the seemingly invisible way our food gets to the grocery store. But veal was all I was willing to give up. When I was a high school English teacher, I’d give up meat for a few weeks while my students and I studied Upton Sinclair’s The Jungle but gradually slip back into my meat-eating habits. My husband and I talked a few nights ago about my feeling equally troubled about becoming a vegetarian and not becoming a vegetarian. He eats very little meat anyway, and so it’s not much of a stretch to see him becoming a vegetarian, but he knows how much I rely on meat as part of my diet. He asked what I would need to continue eating meat. I told him I wasn’t sure. Maybe meat from a local, small farm? But even with improved conditions, would that make the killing of an animal okay enough for me to put on my plate? If I would never kill a chicken myself, and I really dislike handling raw chicken meat, what makes it okay for me to eat it? So I’m facing a dilemma and trying to make incremental changes in the meantime. I’m eating fish just once a week and dairy products maybe a little less than usual, but no other meat (though at some point I will have to decide what to do about what little is in my freezer). I’m also trying meatless options like the one pictured at the top of this post. I don’t recommend Trader Joe’s chickenless strips despite their promise of protein and iron. But I have had some faux chicken that I liked, so I know good alternatives exist. As vegetarianism/veganism becomes more popular, maybe it will become an even easier decision to make. Even Justin Timberlake is on board (or at least his character on a recent episode of Saturday Night Live was, inviting us all to “Come on down to Veganville.”). I’ll continue the debate with myself, and I’ll continue to educate myself. In the meantime, I invite you to weigh in, though I know that opening the floor to comments and opinions might only guarantee I become even more befuddled about the whole issue. This entry was posted in flourishing tree and tagged city girl, corporate farms, diet, dinner, food, vegan, vegetarian diet, Vegucated by hopesquires. Bookmark the permalink. One of our sons is a vegetarian, so I completely respect that choice as well. The ethically raised meat is very expensive, but two of my sons have convinced me that it is not just best for the animals, but also best for the food distribution of the world. We buy local if possible – and sometimes if convenient :-(. It is a journey. Tricia — you’re so right about it being a journey. And I know what you mean about convenience, which happens to be one of my main stumbling blocks right now. I look forward to talking about this more with you next time we’re together! 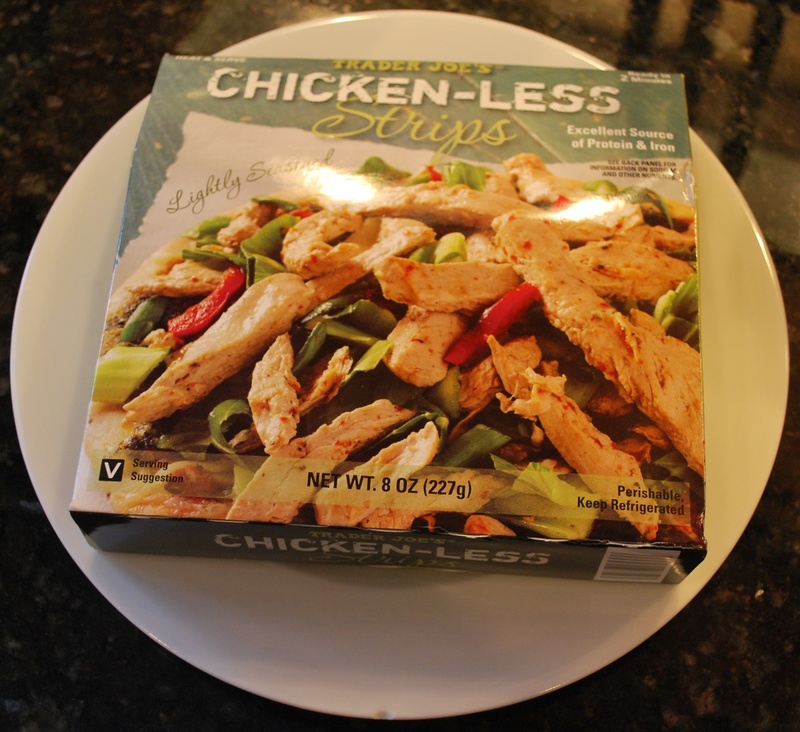 My #1 piece of advice for a budding vegan is to avoid like the plague anything labelled “vegan chickenless strips”! Totally a recipe for disappointment! Processed food crap is processed crap, animal-free or no. Invest in a few vegan cookbooks that gel with your food style and dive into the world of online recipes and you have a really good start. Thanks, Lissa! This is all great advice, and the good news is that my husband and I are already doing much of this. I don’t know what possessed me to try to the chickenless strips, but at least Trader Joe’s takes back anything (part of their risk-free guarantee). These strips are going back. I’m easing into these changes. Nothing radical yet, but I am encouraged to hear that you have survived a long love affair with cheese. I will definitely check out the link you gave. Thanks for that, and for the encouraging feedback. Oh man, I def. went through my fair share of dodgy boxed “meat substitutes” before realising that I was short-changing myself big time, it’s all part of the adventure. “Adventure” is the right word and the right way to approach this! I’m not dairy-free yet, but I can at least envision the day … Thanks again for your encouragement. Try free range and organic meat and bison as you limit your meat. Add chia to your diet. Thanks, Loy. Based on reading I’m doing, not all organic meat is created equal (and I’m not sure I can bring myself to eat bison). Lots of research and reading and learning ahead as I figure all of this out.